Apparently Britain is one of the most tattooed nations in the world. The UK is full (apparently) of people whose bodies are covered with inky designs which map out their lives for all to see (apart from those secret few who keep their tats well out of sight – and sometimes for the better depending on where on the body they are). I have heard it said that this is because we’re a nation of sailors, or at least a nation of sea lovers. I absolutely love the sea. The part I love best is the sitting on the beach and looking at it. I’m so badly seasick that I can’t even manage a rowing boat on a municipal lake, so loving sea views are the closest I get to being truly nautical and although I know a lot of people with tattoos, none are sailors. Getting a tattoo is extremely personal. After all, it lasts forever and notoriously can last longer than the love whose name you have engraved (literally) above your heart. Personally I think people with tattoos fall into two camps; those who have a tattoo because they think it’s pretty and fashionable to get a certain style of tattoo and have it in a certain place on their body. These people think that their tattoo says something about them. Bad news – it does. It tells the world that you’re a follower who tries to fit in with the other people who live the lifestyle you currently inhabit. The reason I know this sadly is because my first two tattoos were very much from this mould. I wanted to show the world I lived in then that I was one of them. I wanted to show the rest of the world that I was quite clearly, not one of them. Of course I didn’t see it like that at the time. I thought I was above such petty things as wanting to fit in, anyway. My first tattoo was a rose. It matched my name, it was red and it was on my upper arm. I showed it in the pubs where I drank and the squats where I lived and people liked it. It was crudely done by today’s standards and cost me £15.00 (which was quite a lot in those days). My second tattoo began to move me away from the “show and tell” tattoo world and into the world of the more profound. It was a wreath with my dead boyfriend’s name on it. I had it on the upper part of my other arm. It cost £25 and again, was crudely done by today’s artistic standards of tattooing. Then I met Mr Reed, my MN and it somehow just didn’t seem quite right to be tattooed with my dead boyfriends name on a wreath anymore. It felt a bit common and obvious, so I went to a slightly more upmarket tattoo artist, paid a considerably larger sum of money and got it completely covered up by a very large and very colourful Chinese style dragon, which covered not only the wreath, but most of my upper arm. Up until now you might have noticed that I haven’t mentioned pain. That’s because I’ve never had a tattoo which was painful. Until the dragon. I didn’t ask and no-one told me in advance, but having a tattoo on top of another tattoo is painful. In fact having a large tattoo on top of a large tattoo is so painful I really don’t recommend it! The years passed and I became so accustomed to the sight of my rose and my dragon (the two sides of my nature as my MN always says) that I really didn’t see them anymore. The colours faded and they looked old. My lifestyle changed, I changed, lots of things around me changed. I had children. I bought a flat. I worked. I never thought about having the tattoos removed though because they were part of who I was. A daily visible part of the past in my present. Then came the day when our world was turned upside down. Actually our world was turned off. Our life, our world, our everything. It was like a switch that was abruptly flicked up and what has come afterwards is so different and awful. Even now I’m just too close to it to even be able to tell you what this new life is truly like. I just know that it’s more different to our old life than I could ever have wanted our world to be. A few months after we lost our golden boy I had his name tattooed onto the inside of my right wrist, where I would see it constantly. I loved it straight away. It made me feel closer to him and I purposely got it done in a place where I would find it difficult to cover and so everyone would see it everywhere I went. Everyone would have to take a moment to think about Nico when they saw it. My tattooist was a lovely, grounded American artist who features on the Miami Ink TV show. A few times a year he works out of a very fashionable tattoo venue in West London (The Love Hate social club). My daughter went to the same place to have her tattoo done (again, not her first one but the difference is that all of hers are really nice) and she had a large and wonderfully artistic, beautifully coloured sunflower inside her left arm so when her arm is by her side it’s next to her heart. It’s a lovely thing and it took hours of work to create it. My daughter remained so stoical throughout the pain that she impressed everyone working there. My nearly daughter went to the same venue and had a large sunflower tattooed down her back, using only black. It almost fills the length of her spine and is very striking. Again it was a lot of work and actually very painful, but it’s lovely. So now I’m at the place where I believe that you should only have a tattoo if you really believe that it will be on your body forever. If you think that there’s the slightest chance you’ll want to have it removed in the future – then don’t’ have it done at all. Don’t have a tattoo because you think it’s pretty or because your friend has one or because you think having one in that particular place looks nice when you wear low-rise jeans. These are all reasons that will pass with time and ten years on, that tattoo will be as meaningless as the reason you had it done. If you’re going to have a tattoo then it must have such a power, a meaning, a force in your life that you can put your hand on your heart and declare to the world “yes, I want to have this on my body forever”. Again, it’s personal. No-one can tell you what you should have done or if you should even have a tattoo. It’s like creating your own birthmark. It’s permanent. It becomes part of you in a very literal sense. Last month I went back to the same American guy in the same venue in West London. I was ready for my next tattoo. 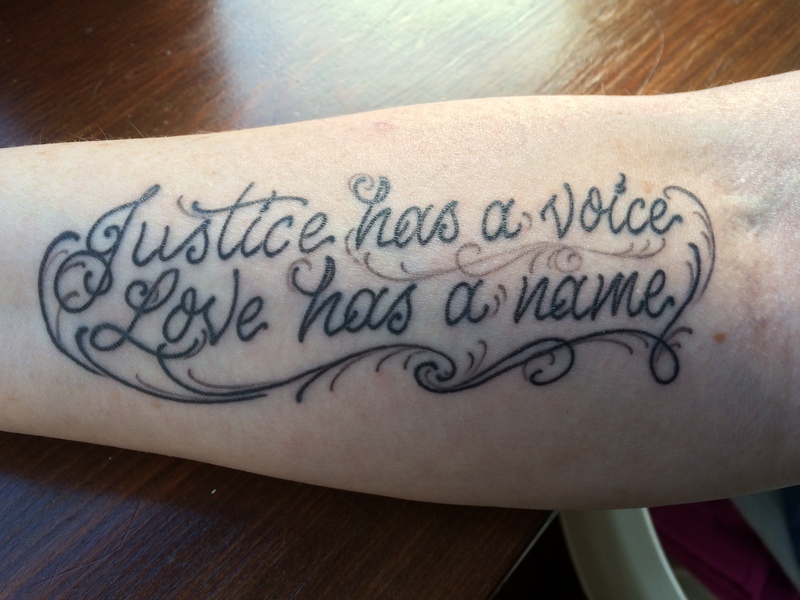 I was ready to have written on my body the next chapter of my story – of my fight for justice for my son and the undimmed and unfailing love I have for him. But before I show it to you I want to tell you a story and first I want to tell you that this is an absolutely true story. It was the night of the first anniversary of Nico’s death. I fell asleep and dreamt I was sitting downstairs in my house. Nico came into the room and this was the first time that I had dreamt about him since he died. He was smiling. He came up to me and motioned with his hand for me to look down. When I looked down I saw a large piece of paper on the floor. On it these words were written. I asked Nico “what does it mean” and he replied “you will understand when the time comes”. The words I saw written were these. God Rosi that is the most beautiful and moving story I have read for a long time. I love your tattoo and yes I do totally believe Nico came to you in spirit with that message. I am going to have to buy MORE tissues again if you keep this up.!!! Deb – sometimes I think my blogs aren’t complete until I’ve read your comment! We should take shares in a tissue company don’t you think?